Now available is the AEV Brute Truck Conversion Kits for Wrangler. This kit is available directly through American Expedition Vehicles or through Quadratec. This unique design brought to us from AEV was first seen at the 2002 SEMA show and received DaimlerChrysler's Design Excellence Award. Now you can build one, prices for the complete kit start at $8,995.00 Brute components can also be purchased separately for you to build as time and money permit. AEV claims an average build time of around 60 hours. Claiming the kit is over 90% assembled. Changes from the original Brute concept include an all new hardtop for increased headroom which includes two small skylights. Redesigned stamped steel bed offering more storage space. 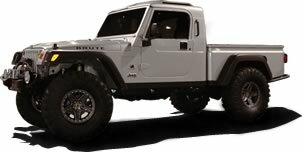 See it for yourself by visiting AEV or Quadratec's web site and start building your own awesome Brute Jeep Truck.